K. P. Harrington's Mediaeval Latin, the standard medieval Latin anthology used in the United States since its initial publication in , has now been completely revised and updated for today's students and teachers by Joseph Pucci. This new edition of the classic anthology retains its breadth of coverage, but increases its depth by adding fourteen new selections, doubling the coverage of women writers, and expanding a quarter of the original selections. The new edition also includes a substantive grammatical introduction by Alison Goddard Elliott. To help place the selections within their wider historical, social, and political contexts, Pucci has written extensive introductory essays for each of the new edition's five parts. Headnotes to individual selections have been recast as interpretive essays, and the original bibliographic paragraphs have been expanded. 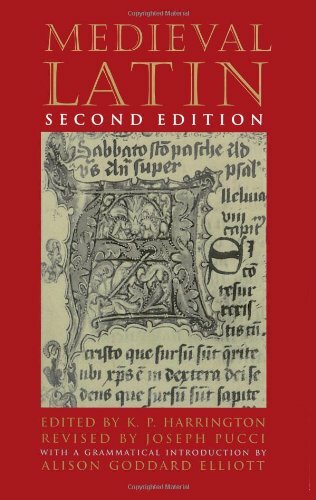 Reprinted from the best modern editions, the selections have been extensively glossed with grammatical notes geared toward students of classical Latin who may be reading medieval Latin for the first time. Includes thirty-two full-page plates (with accompanying captions) depicting medieval manuscript and book production.